Bruce Lee was my first martial arts hero as he was for everyone else from my generation. 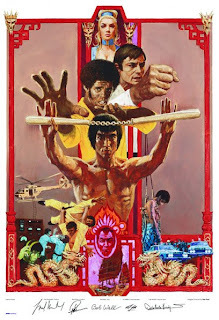 Originally he appeared in the short lived The Green Hornet TV series, but when I think of Lee the image that really stands out in my mind is that Enter The Dragon movie poster with his dreaded nunchaku held out in a menacing pose. Of all the traditional weapons (kobudo) I'd have to say that the nunchaku are possibly the most potentially lethal, because of its whip-like action. Like its kobudo relatives, its original purpose was for farming; in this case to thresh grain in the fields. Pre-industrial farming was quite arduous, and it didn't take long for the oppressed but hardened Okinawans (who were banned from using conventional weapons by foreign rule) to figure out that these farming implements could be used as convincing deterrents against a variety of neighboring invaders. Over the weekend a British lad was killed by some lunatic showcasing his nunchaku skills, and since this occurred at a youth party I'm guessing alcohol was involved. A few months ago a couple of martial-art "retail suppliers" from my area were busted for selling samurai swords, throwing stars and the like to minors. In my day, drug paraphernalia were the hot novelty items, not Asian weapons. Socrates' assertion that kids' behavior has never been worse is probably wrong, but they do seem to be more violent today than ever, especially as one witnesses the increase in use of armed security and metal detectors at public schools. Somewhere I have a book with an old photo of Taira Shinken - the preeminent Okinawan kobudo master - training with a pair of sai (tri-pronged daggers) while donning some heavy full-body protective gear, possibly for some free-style action. Could you imagine sparring with these things? Supposedly it was US marines that trained in Isshinryu karate who created bo-bo kumite to simulate an actual battle between two bo (staff) wielders. It's a prearranged form, but with some tweaking and a little know-how it can be made to look like a real fight. Although historically weapons came first in the martial arts, most schools won't introduce traditional weapons until the student approaches a brown belt grade. Karate is a way of life, but I'm not sure what kind of life skills can be gleaned from the practice of kobudo. Regardless, kobudo - like karate - represents a part of the culture, heritage, and history of Okinawa. Violence is still a problem, no doubt, but even a decade ago, the odds are strong that we wouldn't have heard about the English boy's death, which makes us much more aware of the effects of violence in our society. I would say the awareness itself is a good thing, but we shouldn't mistake an increase in awareness for an increase in the actual amount of violence. It's really a matter of context in my opinion. Empty hand techniques can be lethal. One thing that any dojo or dojang should repeat is the fact that give the right circumstances, even a mid-belt could kill or injure with their hands. The threat of getting sued and going to jail should also be emphasized. It's not like the movies. As far as weapons...my personal opinion is that no one under 18 should be allowed to learn a weapon form. However, I've seen a kid that had to be 10 exhibit nunchuka skills that Lee might envy. At least most good martial arts schools add a healthy level of philosophy into their training. I think that helps to curb some stupidity. Some of the kobudo weapons have more practical application in the modern world than others; my own instructor leans toward the jo, and I can understand why--pick up almost any decent-sized stick, and you've got something going. Most of the others, though--well, I like the sai, mainly because using it helps strengthen my hands. But I'll be darned if I can imagine the circumstances under which I'd actually be carrying the things around. Bruce Lee was my first martial arts hero as he was for everyone else from my generation. Karate is a way of life, but I'm not sure what kind of life skills can be gleaned from the practice of kobudo. I will venture a guess as to why kobudo is such a big deal. It is kool and it is far more fun to practice than empty hand. I was a part of a dojo where one of the black belts decided to teach kobudo separately and told the entire class, white to brown, they could participate. Everyone of them came to the kobudo class to include the white belts. They all want to be Bruce Lee with the flashy nunchaku's. Supposedly it was US marines that trained in Isshinryu karate who created bo-bo kumite to simulate an actual battle between two bo (staff) wielders. This is correct. Advincula Sensei has verified this. He was there. There was a lot that came from the influences of the Marines, especially Advincula Sensei. He would ask Tatsuo Sensei and if he received a nod it was ok and if Tatsuo Sensei said nothing it was not ok.
A lot of Marines mistook Tatsuo Sensei's lack of response as an affirmative. Long was one of them. For most of us, the most effective way to use nunchaku would be to hand them to our opponent, and watch him beat himself to death with them. Seriously, while we're not likely to use traditional weapons in a modern combat setting, there is much to be learned from them. From my own experience in aikido with bokken, tanto, and jo, I'd like to use the jo (about a 4' staff) as an example. If you're body position is just a little bit off, the far end of the jo will be way off. It is a training tool to improve the precision of your stance. It is also a great tool to learn to work with understanding distance. I don't want to write a book here, but I think you can get what I'm getting at. As someone who practices both open hand and kobudo, the real life skills are definitely there. An overhead strike with a bo is nothing more than a well executed punch. Without a weapon in the hand, a weapons kata can still be a powerful thing. In my school, there isn't much weapons practice for the beginner (up to green belt), but there is some. At my old school, lots of little kids were using weapons on a regular basis. I think that as long as they're learning them correctly and they're learning safety along with the weapon, then there's really no harm. Bo/Bo is one of our kata's and done at a decent speed, it is a very cool kata that absolutely appears to move at a fighting pace. That is not required until Nidan though. Basically, I'd just like to chime in with the others here in saying that I find weapons training to be of immense benefit. I'm a Korean stylist practicing both Taekwondo and Haedong Kumdo. Kumdo is actually where I started, and I personally find it to be of more potential benefit than empty-hand training, because of its relative lack of application. As an instructor, it is not my aim to train fighters. When I teach someone how to throw a punch or kick, they can go home that very night and punch or kick someone. I have handed them a loaded weapon, and the disconnect between study and application may not yet be fully formed. People still punch and kick each other in our society. In swordsmanship, this is not necessarily the case. As an antiquated practice, it is removed from our current society. We can study its philosophy and discipline, and students, perhaps even because of the increased potential for lethal violence, learn to respect the weapon and in turn themselves. As such, we don't study swordsmanship to better learn how to throw, punch, or kick. We study it for its own sake. Not to knock my own TKD classes, of course. Just taking a stand for weapons training. I invite you to check out my blog, The Martial Artist for more of my thoughts. Thank you. I think that the basic lessons that we learn through Kobudo can be adapted, and used with any nearby "weapon" if we needed to do so. Just think about a person who might found himself in a dangerous position of self defense. He may find a nearby piece of wood/metal/plastic, and with his knowledge of using basic weapons, be able to effective use this as a makeshift tool. Sure.. he might get a couple of splinters in his hands, but he might have a better chance of walking away from the confrontation. I've been shown that something as simple as a ballpoint pen can be useful to enhance a joint lock, or be held as an extension of a strike. It's all in perception, and adaptation.